COLUMBUS, Ohio - A man participating in the third-annual Steve Barbour Memorial Tour died after losing control of his bicycle and crashing into a guardrail Saturday morning. Charlie Shu was one of about 250 riders participating in the ride, which was part of the weekend’s Bike Columbus Festival. According to the Pickaway County Sheriff’s Office, Shu was traveling down a steep hill on Morris Salem Road, south of Tariton Road in Pickaway County, at about 10:20 a.m. when he lost control and struck a guardrail. Shu was ejected and struck the guardrail. Shu, 48, who was wearing a helmet at the time of the crash, was pronounced dead at the scene. The Steve Barbour Memorial Tour helps promote bike safety and education programs. The ride began on West Broad Street near COSI and traveled south to Hocking County. Ira Weiss, Consider Biking vice president, and Frank Seebode, a ride organizer, offered their condolences to Shu’s family and friends and to the riders who assisted at the scene of Saturday’s fatal crash. Israel Nebeker has a message for the musicians of Austin. If you dread piling into a van for weeks at a time and dropping hundreds of dollars on gas, Nebeker would like you to know that there's another way to tour: by bicycle. "Touring in an automotive vehicle is horrible. After about a month, it starts to break you down," says Nebeker. "On a bike, though, ... I don't think you could have a bad experience. Even if it's a sketchy experience, you're just creating pretty amazing stories." Nebeker is the self-effacing singer, songwriter and guitarist for Oregon-based sextet Blind Pilot, which has twice — in 2007 and 2008 — toured the West Coast by bicycle. Both tours were about 1,500 miles and took about six weeks, and their longest day of riding was about 120 miles. The band began as a partnership between Nebeker and drummer Ryan Dobrowski. Together, they crafted buoyant, vulnerable, soaring folk-pop in the tradition of Bright Eyes, M Ward and Damien Rice. Their first album, "3 Rounds and a Sound," a cult hit released in 2008, earned plaudits from USA Today, the Boston Globe, NPR and others. Blind Pilot expanded to six members and racked up festival appearances and opening slots for the Decemberists, Counting Crows, Hold Steady and Dave Matthews Band. NEW REPORT: Public bikesharing—the shared use of a bicycle fleet—is an innovative transportation strategy that has recently emerged in major North American cities. Information technology (IT)-based bikesharing systems typically position bicycles throughout an urban environment, among a network of docking stations, for immediate access. Trips can be one-way, round-trip, or both, depending on the operator. Bikesharing can serve as both a first-and-last mile (connector to other modes) and a many-mile solution. As of January 2012, 15 IT-based, public bikesharing systems were operating in the United States, with a total of 172,070 users and 5,238 bicycles. Four IT-based programs in Canada had a total of 44,352 users and 6,235 bicycles. This study evaluates public bikesharing in North America, reviewing the advances in technology and major events during its rapid expansion. We conducted 14 interviews with industry experts, public officials, and governmental agencies in the United States and Canada during summer 2011/spring 2012 and interviewed all 19 IT-based bikesharing organizations in the United States and Canada in spring 2012. Several bikesharing insurance experts were also consulted in spring 2012. YEAR OF YAY! is a series of 12 rides to celebrate our city and promote membership in Yay Bikes!. Everyone who rides with us will receive an exclusive button designed by Bandito Design Co, as well as other goodies TBA. July's theme is Fine Dining. Meet at 12:30PM at the open air shelter in Goodale Park and roll around 1PM. The food lineup is Milestone 229, Due Amici, alana's food & wine, and Vienna Ice Cafe. All YoY rides are FREE for Yay Bikes! members and $5 for everyone else. Become a YB! member at http://yaybikes.com/membership/. Hey CBus Cyclists- We'd love for you to join our low-budget tour on Sat., July 21st. Supported stops for 35, 62, and 74 mile routes from New Albany to Utica. 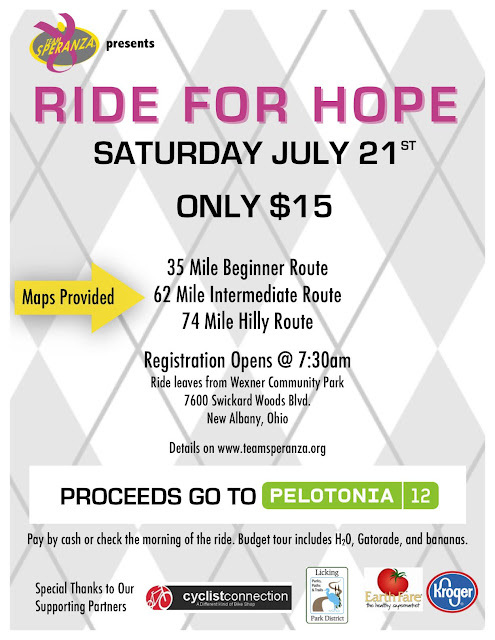 Routes designed forPelotonia 12 training. 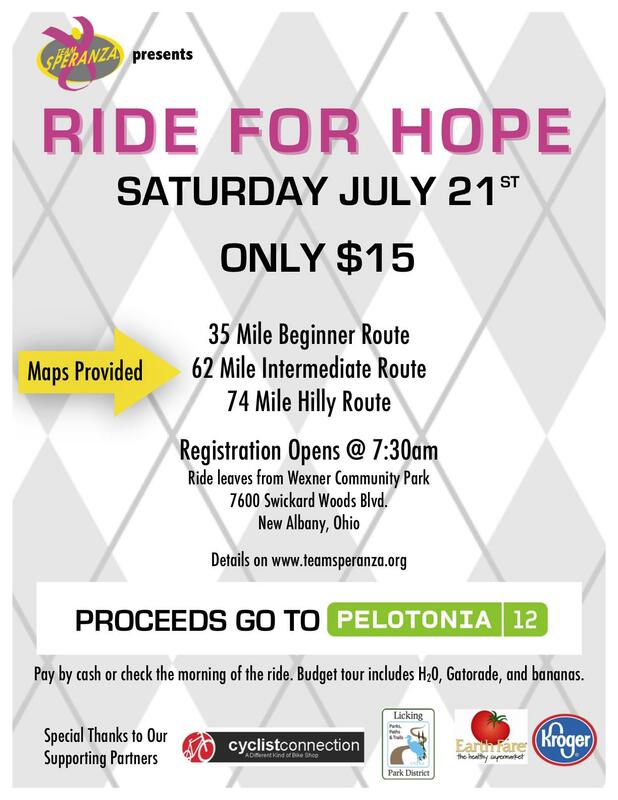 Proceeds benefit Pelotonia! Fryday the 13th ride is TONIGHT! This ride is FREE! 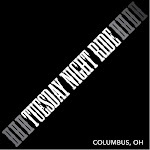 We will be riding from Hal&Al's to the Food Truck event at the Columbus Commons. Afterward we be visiting some cemeteries around Columbus to celebrate the 13th and its spookiness. We will return to Hal&Al's for drink and fry specials to celebrate National French Fry Day! Meet at 630pm and be ready to ride at 7pm. Lights and helmets encouraged. Reporter Luke Brocki takes cycling conference head on. Photo by Mellisa Mills. To my left sits the grinning, bearded and silver-haired German entrepreneur Manfred Neun, trained in psychology and economics. Since 2005 he's been president of the European Cyclists' Federation and a major player in the world of cycling advocacy. To my right is the stoic and peeved German political scientist Hans Michael Kloth, former political editor at Der Spiegel and now acting secretary-general of the International Transport Forum at the Paris-based Organisation for Economic Co-operation and Development.The scene is a massive hotel in Vancouver, but it feels like Europe. The place is crawling with men in pointy shoes and shirts with the top few buttons undone. Women wear scarves, skinny belts and summer dresses you won't find at the local outlet store. They all speak a language reminiscent of English, yet coloured with odd bits of German, French, Spanish and Flemish dialects of Dutch. This bike love-in is a delightful and cosmopolitan affair. It's an upbeat, friendly beginning. The trouble starts in an upstairs media room, where, morning plenary complete, I sit around a table with some of the world's brightest minds in cycling policy and realize I'm the only reporter present. Where the hell is everybody? This is a smorgasbord of cycling knowledge and I'm the only one feasting. The category of clip-in bike shoes that “don’t look like bike shoes” has grown in recent years. At least one of the GearJunkie staffers rides in each day wearing shoes that lace up and appear normal (stylish even!) but under the sole in fact is hidden a bolted-on cleat that clips into an SPD pedal for more efficiency on his ride. New this summer, San Francisco-based DZR Shoes unveils an expanded line of such stealth biking sneakers. The company’s Task Collection includes a lineup of eight new shoe models “designed with performance attributes for cycling but without the ‘I am a cyclist appearance,’” as the company puts it. Basically, these shoes have a stiff shank to make them rigid while pedaling and a cutout place in the sole where you bolt on a pedal cleat from Shimano, Crank Brothers, Look, or other major brands. They have shoe laces, not dorky ratchet systems, and they are stylish and comfy enough to wear all day long in most any setting. A man is facing drunken driving charges, after allegedly hitting a bicyclist near Weinland Park overnight. According to Columbus police, the crash occurred just after midnight at the intersection of East 8th Avenue and North 4th Street. The bicyclist was taken to an area hospital in stable condition. Police said the driver has been drinking and he was arrested at the scene. COLUMBUS, Ohio - A bicyclist was struck at a north side intersection early Thursday morning. The victim, whose identity was not released, was struck along North Fourth Street at about midnight. The driver, who was suspected of being intoxicated, stopped at the scene and was arrested. The identity of the driver was not immediately released. The victim was transported to The Ohio State University Wexner Medical Center. Last month, Joanna Zuckerman Bernstein was running on a path in Philadelphia. As she approached a curve obscured by bushes, a cyclist slammed into her. "I just remember seeing him, and all of a sudden I was on the ground," she says. She spent the night in the hospital, recovering from a head wound that reached the bone and required three layers of stitches. "I think what happened is our heads hit and then something on his bike must have punctured my forehead," she says about the accident. 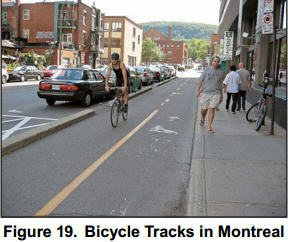 The city path divides for pedestrians and bikers in certain areas, but not where she was hit. "The worst thing for a cycling advocate is to see some other cyclist dangerously blow through a red light. It’s just the worse PR." It’s hard to know if collisions between walkers and cyclists are truly increasing and who’s to blame. They’re certainly generating more attention lately, along with vitriol toward two-wheelers. Crashes have ignited controversies in New York, Toronto,and London. In Philadelphia, bicycle/pedestrian collisions killed two pedestrians and left another with a fractured skull in 2009. This spring, a San Francisco biker struck a 71-year old pedestrian as he crossed the street. The man died a few days later. Jason Hare sold his car five years ago and never looked back. He now commutes to work by bike from his home in Shadyside, saving $8000 a year in car payments and expenses (not to mention losing 45 lbs in the process). "The money we save basically makes it possible to afford a home in a nice neighborhood, close enough to ride to work daily, year-round," he says. When Jeffrey Bergman, director of TreeVitalize, sold his car, it was a weight off his shoulders, he says. He now happily bikes to his office on Washington's Landing. Rachel Dingfelder, 28, has no regrets either. "I ditched my car two and a half years ago for a lot of reasons," says the Upper Lawrenceville resident who works at the Midwife Center in the Strip District. She discovered life was more fun on her bike. So when her car needed a lot of mechanical work, she bid it farewell and joined ZipCar. We are very excited to introduce the Calfee Adventure. Click here to view geometry, features and some feedback. We debuted this model in Austin, TX at NAHBS the weekend of Friday, February 25′th. Both the cycling press and cyclists themselves were thrilled with our execution; enjoy this coverage from James Huang, technical editor with Cyclingnews.com, as well as this October 2011 review in Mountain Flyer Magazine, featuring our Bamboo Adventure. Jan Heine, Editor of Bicycle Quarterly, published a review of our Tetra Adventure in the Autumn 2011 issue. He hated to give it back. Here is a link to the complete review. Monday after the show, we met for a ride with a group from Bicycles Outback in Waco, TX. We “enjoyed” a 110 mile ride on beautiful, rolling gravel roads. The video captures the Calfee Adventure in its intended environment. While we’ve been building this road frame for years, we are only now formalizing its station in our model range. This frame is a high-tech take on a frame that has traditionally been built out of steel or, more recently, titanium. This frame may be described as a Randonneur; a bicycle built for performance through comfort. Our definition of “comfort”, at least in this instance, is “avoiding those things that make a rider go slow”. Consider how wide-tire clearance, full-wrap fenders, integrated lighting systems, optional luggage, enhanced stability and improved vibration dampening, among other features, might enhance “comfort” and then “performance”. Keep an eye on our site and our facebook page for geometry tables, pictures and further specifics; we’ll have them live shortly. You can get a very good estimation for pricing by choosing your frame model (Dragonfly, Tetra or Luna), selecting the appropriate Adventure Frame Options package (disc brake or 57mm reach caliper brake) and any further frame options you’d enjoy from our Price List. Importantly, if you select our dual disc brake frame option, you can select a custom Wound Up fork or our modified ENVE 2 (28c clearance) or Comotion (35c clearance, fender eyelet) forks ($250 + fork); our fork modification features the addition of disc brake tabs to a stock carbon fork, adding only 63 grams (413 gram fork weight for ENVE 2). We had our ENVE disc brake fork tested by ACT and it passed the EN 14781: 4.9.7.3 – disc brake fatigue test. It is now for sale for $650 (only $250 more than a stock ENVE 2 fork). This fork is perfect for tires up to 700 x 28; if you’d like to run wider tires, select the Comotion or Wound Up fork. As shown with our SRAM Force stock build kit and fenders, this complete bike weighs 17.5 pounds/16.5 without fenders. This bike would retail for around $6300. We’re currently building and delivering these frames to clients all over the world. Please contact us if you are interested in more information. Momentum Magazine Issue 57 - Available Now!